Chandler, Arizona, February 6, 2010 – USTA Central Arizona hosted a QuickStart training at the Boys and Girls Club Campadre Branch gym in Chandler, Arizona. Of the twenty-five people who attended the three and a half hour training, twenty were Boys and Girls Club staff. Trainees learned the basics of the USTA QuickStart curriculum from Cindy Benzon, USTA National Recreational Coaches Trainer and TSR of the Texas Section. She took the instructors through the various skills and drills that are used to introduce tennis to children ages 5-10 years old. At the end of the training, Cindy ran all the instructors through the QuickStart Jr. Team Tennis matches that the children in the program will play. The East Valley Boys and Girls Club of Arizona was given the resources to introduce tennis to their children in each of their eleven branches by the Phoenix Country Club. Last year, Sara and Dan Stablien of the Phoenix Country Club directed a 50k Women’s Pro Circuit tennis tournament. They donated the proceeds of the event to the Boys and Girls Club so that they would be able to give each child in the club the opportunity to play the “sport of a lifetime.”	Each club will have their own in-house QuickStart Jr. Team Tennis League, and the kids who excel and want to continue will have the opportunity to play interclub matches against other branches of the East Valley Boys and Girls Club. The remaining attendees were instructors that will be teaching in the USTA Central Arizona After Schools Tennis program. Currently, Central Arizona is working in seven school districts to introduce tennis to young children. USTA Central Arizona is adding an eighth district this spring, Gilbert Public Schools. 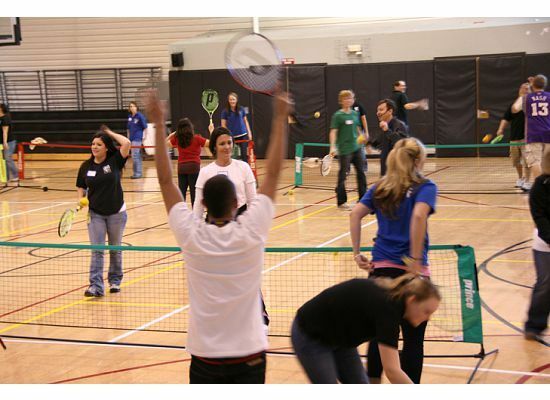 The launch of the USTA Central Arizona QuickStart After Schools Tennis program took place in fall of 2009. In the first three months, the program introduced tennis to over 400 children. These children participated in a six-week class where they learned the basics of tennis. At the completion of the six-week program, they were invited to participate in a tennis carnival (three tennis carnivals were held around the Greater Phoenix Area), where they competed on teams, hit for targets and played in QuickStart Tennis Tournaments. USTA Central Arizona is now in the process of launching its first season of QuickStart Jr. Team Tennis. This gives the youngsters the opportunity to use the skills they have learned in the After School Program and compete as part of a team for their respective schools, creating a strong camaraderie amongst the junior players. The goal of the QuickStart After School Program is to reach 1000 new children during the course of 2010 in the eight school districts. Inside each of the eight districts, QuickStart Jr. Team Tennis leagues have been established, with a start date in the beginning of March. The Boys & Girls Clubs of the East Valley has been in existence since 1963, when it began as a one club site – the Tempe Boys Club. A group of dedicated Tempe citizens who recognized the need to provide a safe place for boys to go started the Club and paid to keep it open and available to the children. They are a community-based, character building youth development organization, who delivers the highest quality programs and provide opportunities to assist youth and teens in developing their self esteem, values and skills in a fun and safe environment. Their professionals guide members through personal, educational and social development to realize their full potential and become positive, value-oriented and productive citizens. QuickStart tennis is a new play format to help children learn how to play the game of tennis with age and size appropriate equipment. QuickStart tennis includes six specifications - including age, court size, racquet length, ball weight and speed, net height and scoring format. This enables youngsters to practice and	play real tennis to scale and allows them to play and learn at the same time—as opposed to the traditional model of learning skills before playing the game. Since rallying and playing is much more fun than standing in line, children will want to continue to learn the game and develop the skills necessary to play with their friends on a team. The goal of the QuickStart junior team tennis is to get kids playing as soon as possible -- and this includes friendly matches, team play, and tournaments. Team Tennis is about turning an individual sport into a team sport. Look around at the other youth sports to see that kids love playing sports with their friends. Not only is it fun and social but it is practical. Team practices keep kids learning, and team matches give them a place to apply the things they have learned. So while learning, they’re also having a great time with their friends.